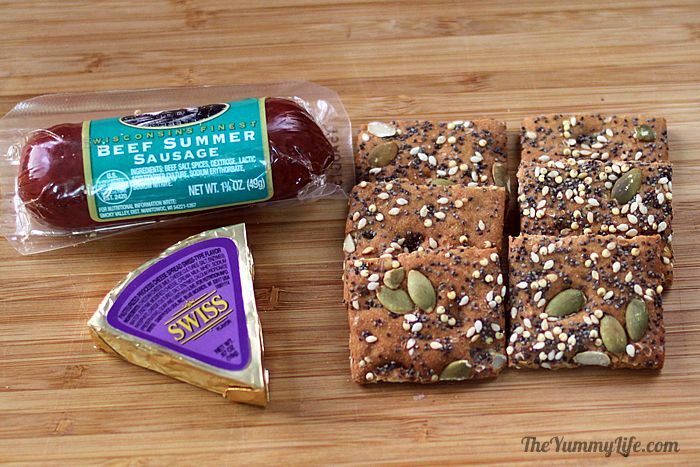 These are our favorite crackers both at home and on the trail. This 6-box economy pack has a long shelf life, so we like to stock up. These single serving packets are portable and perfect for a boost of protein & healthy fat on the trail. Click below for other nut butters and flavors. If you don't want to make your own, this Mountain House brand is surprisingly tasty. Click below for breakfast meals. King-Man is partial to the teriyaki flavor. Click below for more flavor options. If you don't want to make your own oatmeal packets, these are a convenient low-sugar variety. This is the strongest of their instant coffees with bulk economy pricing. For other varieties and quantities, click below. These don't require refrigeration making them suitable for backpacking. Click below for more varieties. This is compact and lightweight. Great for seasoning your food on the trail. Pack your food in here to protect it from bears. 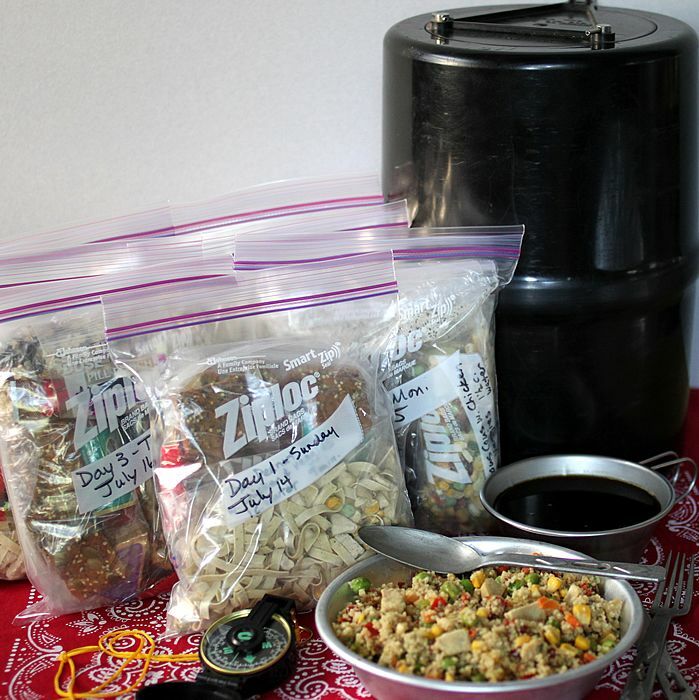 If you're not hiking in bear country, you can use a stuff sack to hold your food (click below). 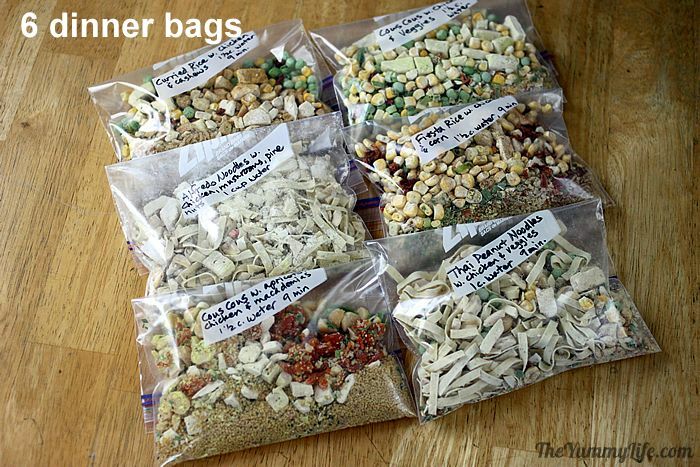 I use these to pack each day's food -- 1 bag per day. They are sturdy and hold up well inside a backpack. Click below for other plastic bags I use for packaging. 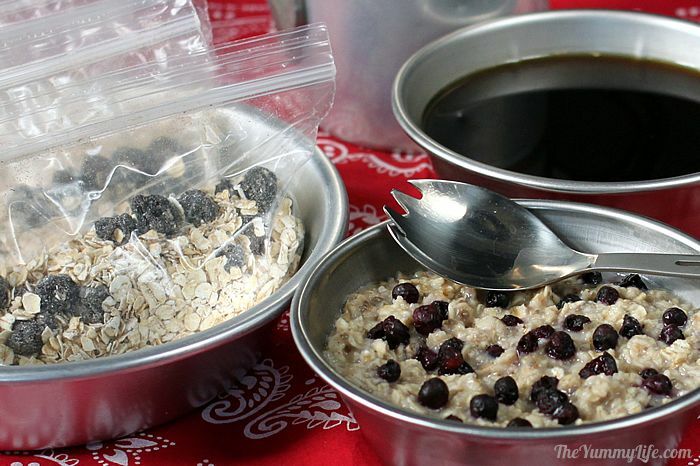 How to make and pack 7 days of breakfasts, lunches, dinners & snacks for camping & hiking. Everything fits in a bear barrel. I am married to a serious backpacker. King-Man goes on several backpacking trips a year. He spends 1-2 weeks hiking the Grand Canyon every year (his favorite place on the planet), and in recent years has also hiked to the Mt. Everest Base Camp, Mt. Rainier, and numerous spots in Utah and Colorado. The more he hikes, the more he wants to. It's his thing. He used to go most often on trips led by Sierra Club or REI where they provided most of the food. But now that he's more experienced, King-Man has been backpacking with a group of hiking friends that has formed through the years. That means he has to take his own food. This is where I come in. King-Man doesn't cook at all. Since I'm a recipe developer, I thought it would be fun to figure out some tasty, homemade, nutritious food for him to take along on the trail. 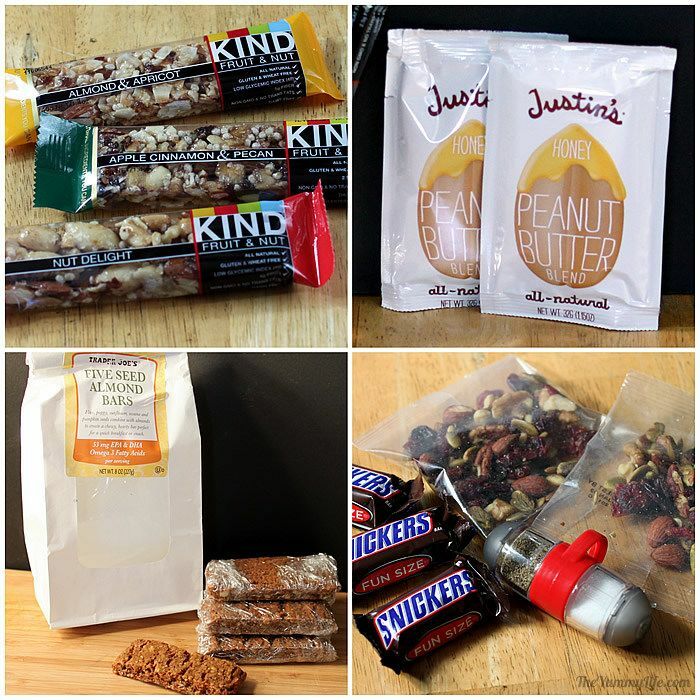 He had bought and assembled ready-made backpacking food in the past, but I decided to try creating some dried, lightweight recipes suitable for backpacking (or any type of camping, for that matter). That way I could make it as nutritious and tasty as possible. King-Man thinks my homemade instant meals are way better than the store bought stuff. Lightweight & compact. King-Man backpacks for a minimum of 1 week at a time, and he has to carry everything he eats. The food needs to weigh as little as possible and be easy to carry. No cooking, just boiled water. This means less to carry in the way of cooking gear. So, meals have to be an "instant" variety that requires nothing more than adding boiling water. Nutritious. 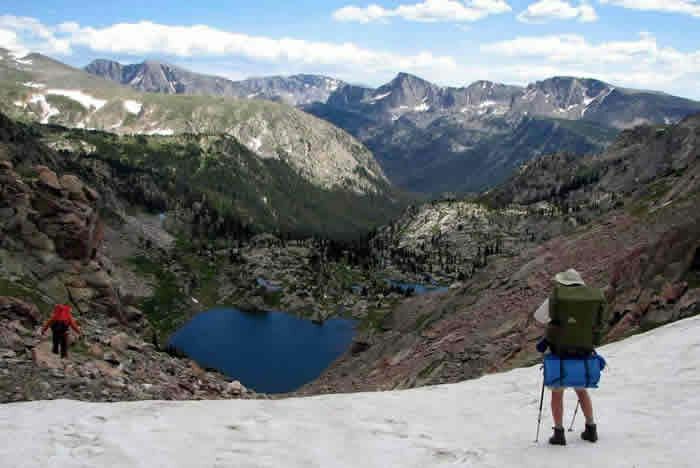 Backpacking is hard work and expends a lot of calories and nutrients. It's important for the food to be dense in nutrients and calories in order to refuel the body. Safe to carry without refrigeration. For obvious reasons. Fits in a bear barrel. This isn't always a requirement; but last summer when King-Man was backpacking for a week in Colorado, he was in bear country. So, the food he took along had to be very compact so he could pack it safely inside a bear barrel. It was a challenge, but we did it! 7 days of recipes and organization tips. 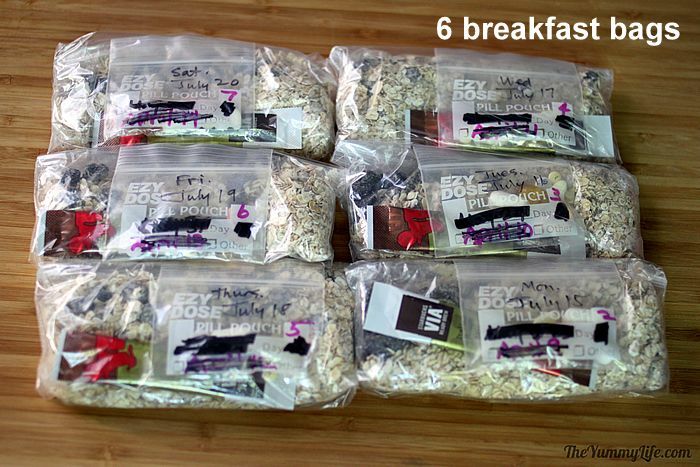 In this post, I'll explain how I assembled food for a week of backpacking including breakfast, lunch, dinner, and snacks. You may prefer to purchase all of your food rather than make your own instant meals. 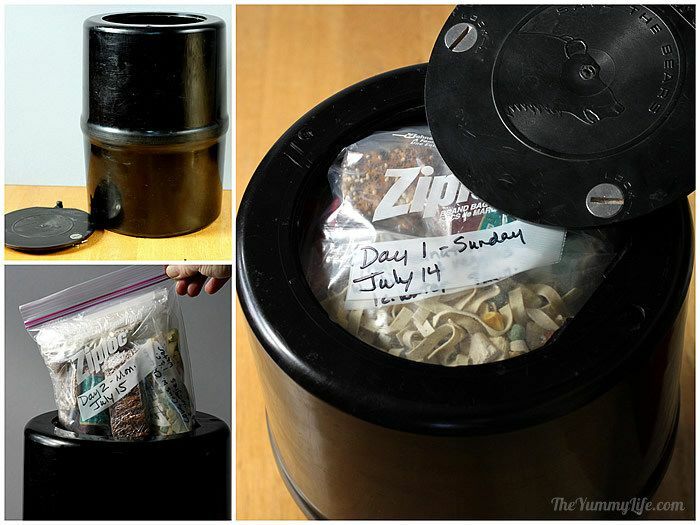 Either way, I'll show you how to organize and pack it in a bear barrel so there is easy access to each day's food. Instant coffee or tea bags. King-Man takes the Starbucks instant coffee packets. 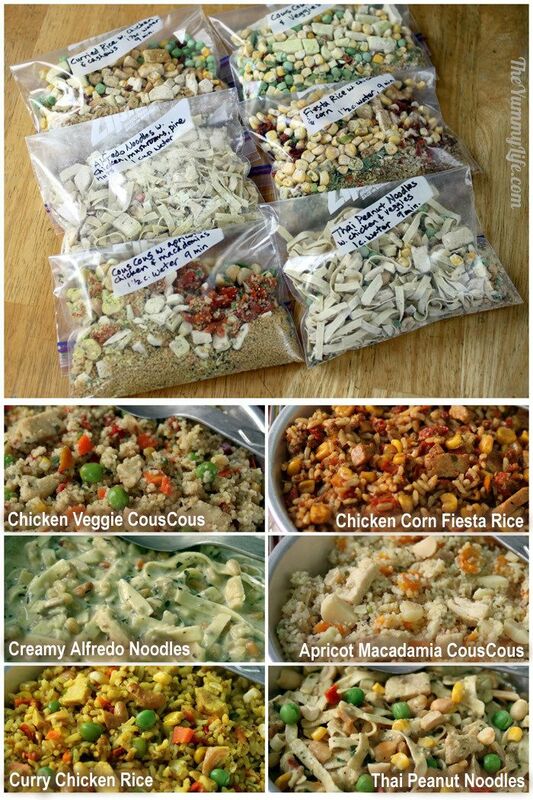 Homemade Instant Oatmeal Packets. 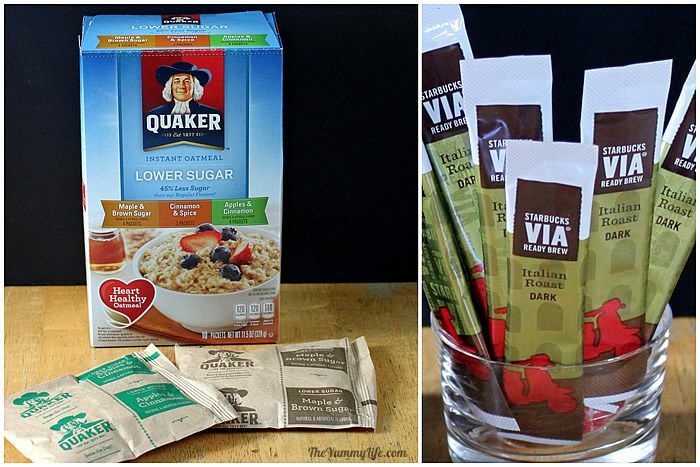 I have a separate post that explains in detail how easy it is to make your own instant oatmeal packets. That way they can be flavored just how you like them, and they are WAY more nutritious than the store bought kind. King-Man is partial to blueberry instant oats, so I made up multiple packets of those for each of his breakfasts on the trail. 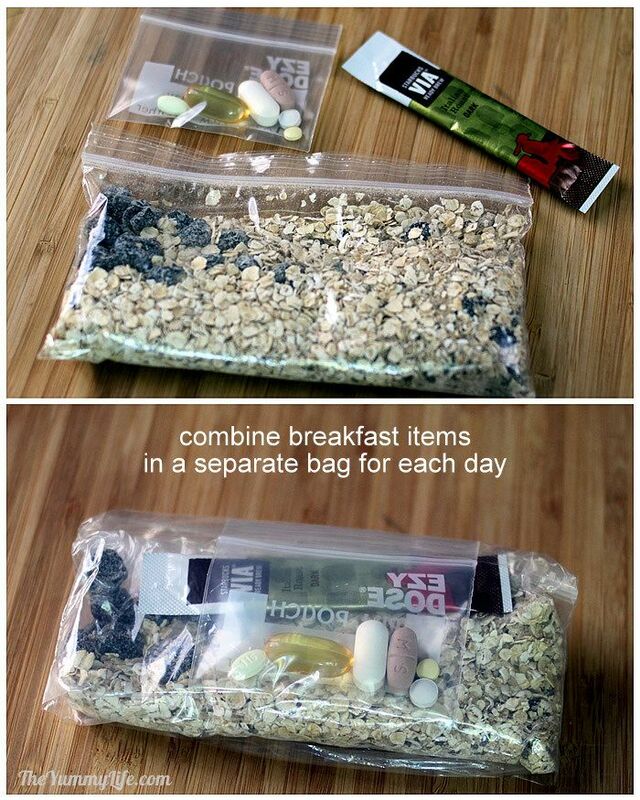 A separate breakfast bag for each day. Included: packets of instant oatmeal, coffee, and pills/vitamins. I used fold-top sandwich bags to hold all 3 items. Mini summer sausage (found these 1.75 oz little guys at World Market); beef jerky is a good alternative that King-Man often takes. Whole grain crackers. King-Man especially likes Dr. Kracker's Seedlander crackers; they are dense and not as brittle as many crackers so they hold up well on the trail. And, they taste great and are nutritious. 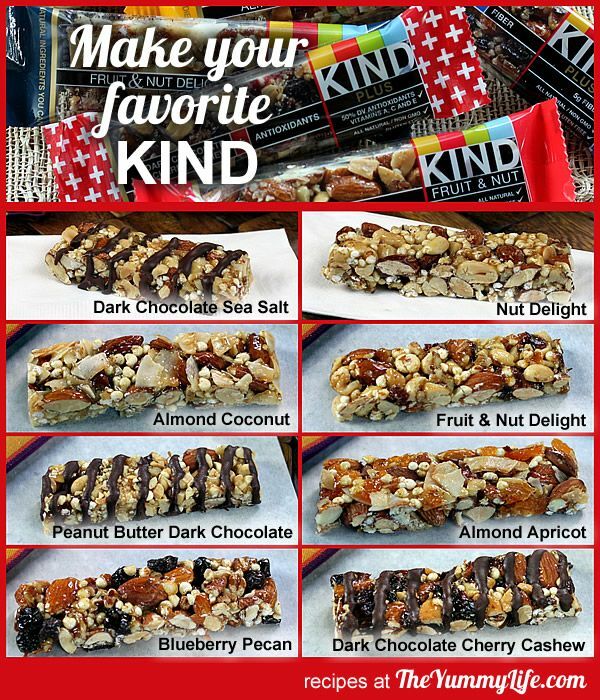 Nut & seeds bars -- I purchased 5-seed almond bars at Trader Joe's; there are lots of granola bar alternatives available. King-Man likes Clif Bars, too. 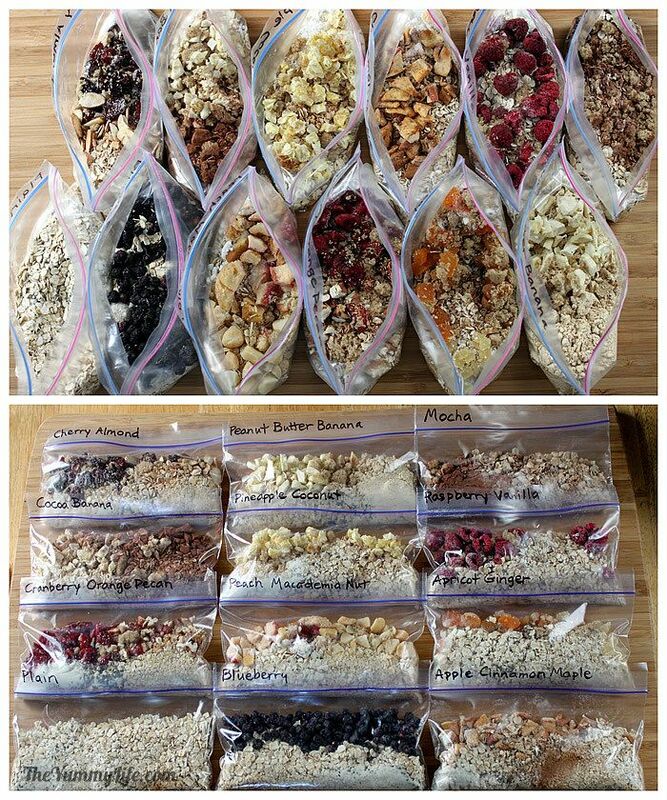 A separate lunch/snack bag for each day. 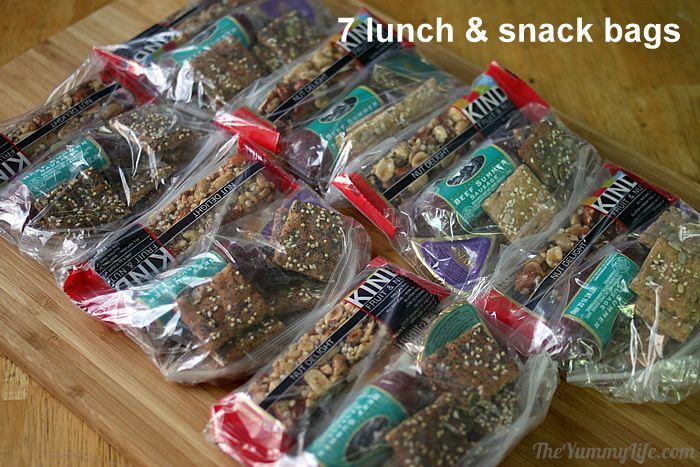 Included: small sausage, cheese wedge, crackers, KIND bar, peanut butter packet, candy or nut/seed bar, trail mix. 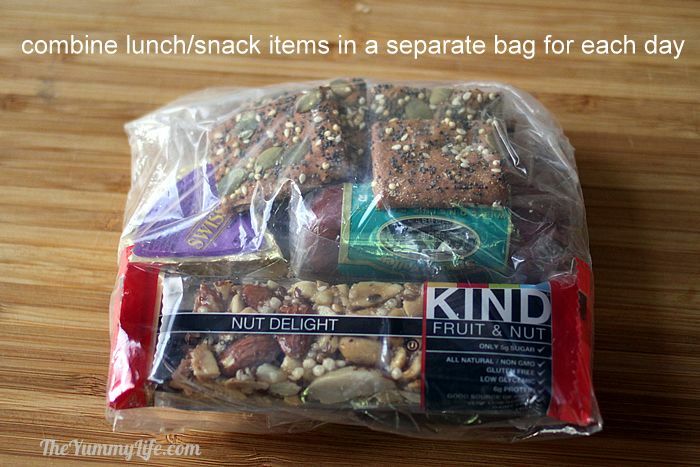 I used fold-top sandwich bags to hold a day's lunch and snack food. An instant, lightweight meal in a bag--just add boiling water, wait a few minutes, and eat. You can buy them or make your own (recipe link below). 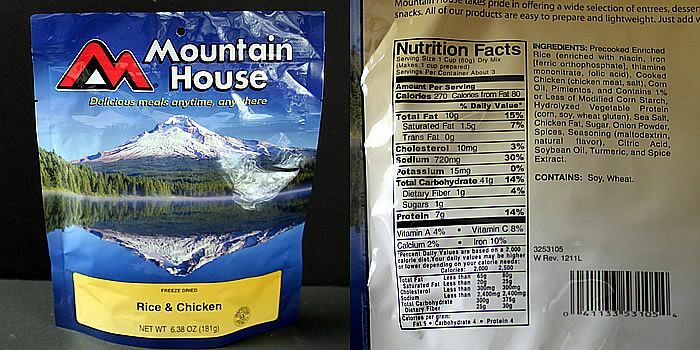 If you're buying the ready-made meals, King-Man recommends the Mountain House brand. ONE BAG OF FOOD PER DAY. This made it easy for King-Man to eat each day without having to rummage through his backpack for a lot of miscellaneous kinds of food for each meal. 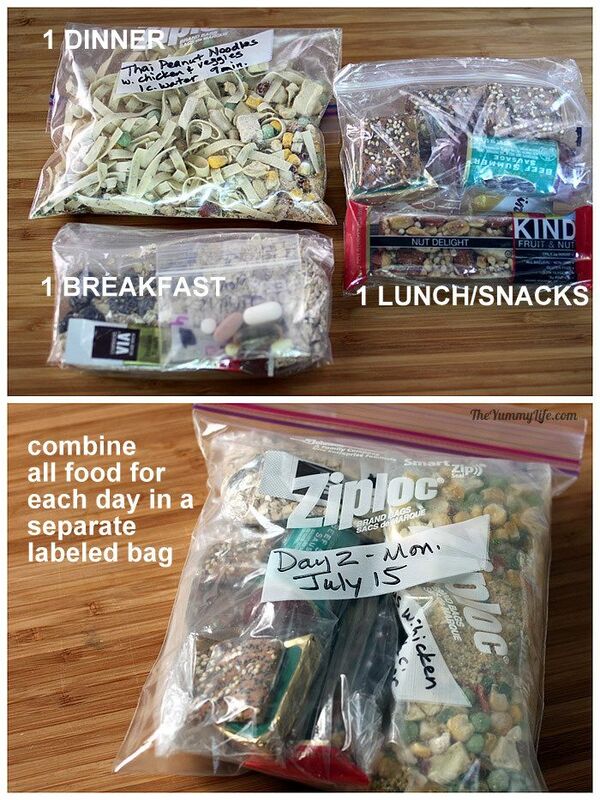 For each day one bag held 3 separate bags for breakfast, lunch/snacks, and dinner. Labeling the bags, made it a no-brainer to eat each meal without any decisions to make. King-Man especially liked this on long days when they set up camp late and it was getting dark near meal time. 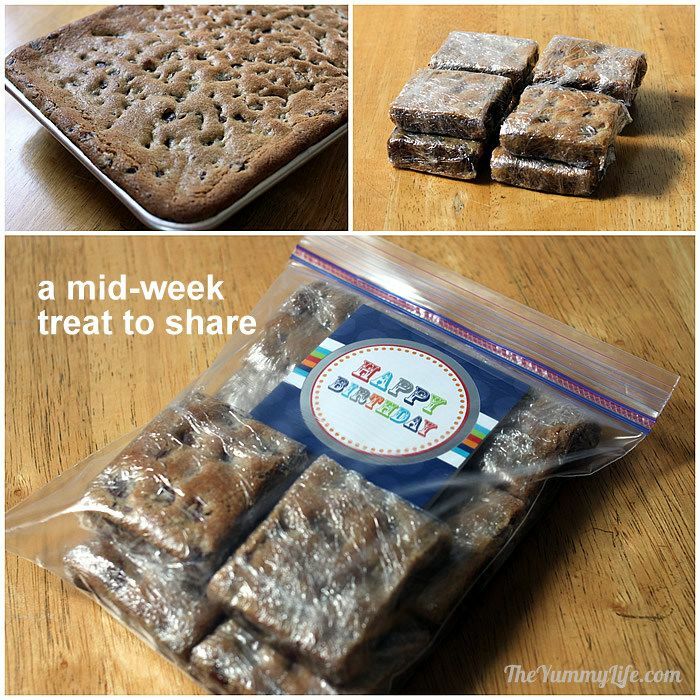 I used Ziploc quart freezer bags--they're thick enough to hold up well. A midweek birthday treat surprise. It was King-Man's birthday in the middle of his 7-day backpacking trip. So, I sneaked in a bag of chocolate chip cookie bars for him to share with his hiking companions. He said it was the BEST part of the food on the trip, and a welcome treat for everyone. So, I've started making these for all of his trips now--he has one for dessert after dinner each night. You'll find my recipe for the bars in this post: Whole Grain Chocolate Chip Cookie Bars. Wrap the cooled bars individually in plastic wrap, and they're ready to pack for the trail. Stack the bags in a bear barrel (or stuff sack). If you're backpacking in bear country, you'll want the protection of a bear barrel (for you and the food!). If not, pack all of your food in one stuff sack. Put the bag of food for the last day in first, and continue stacking the bags horizontally ending with the Day 1 food bag on top. Everything fit--YAY! King-Man loved the convenience of just having to pull out one food bag per day from the top. 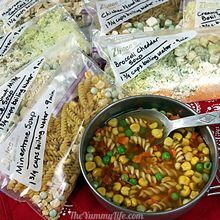 UPDATE: Since first writing this post, I've created 8 instant soup recipes that King-Man now takes on his backpacking trips along with the other food in this post. The soups are a great way to help rehydrate and add some calories to the main meal at the end of a long day on the trail. Here's the link. With the understanding that every backpacker has his/her own way of doing things, I know this system may not work for everyone. But, hopefully there are some tips or recipes here that you will find helpful. If you have any tips to share that are tried-and-true on the trail, please share them in the comments section below. Happy trails to you. Here's King-Man with our two sons, Tyler (aka T-man, techie guy for TheYummyLife) and Bracken. 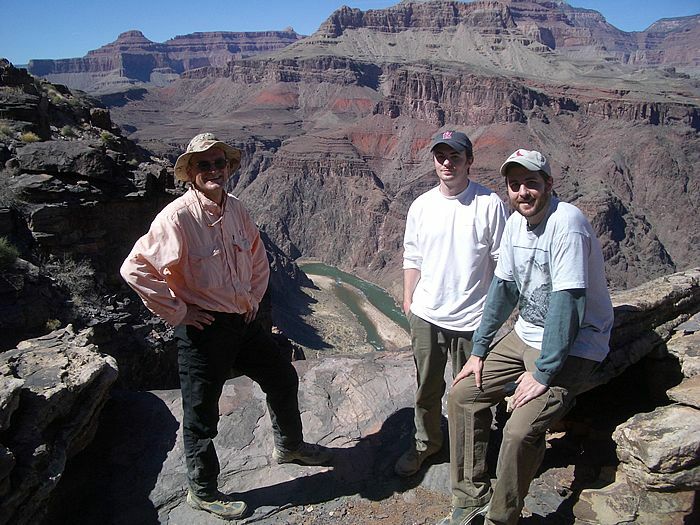 They were taking a break on their descent into the magnificent Grand Canyon. Their backpacks didn't require a bear barrel on this trip, but they had to carry a lot of water.